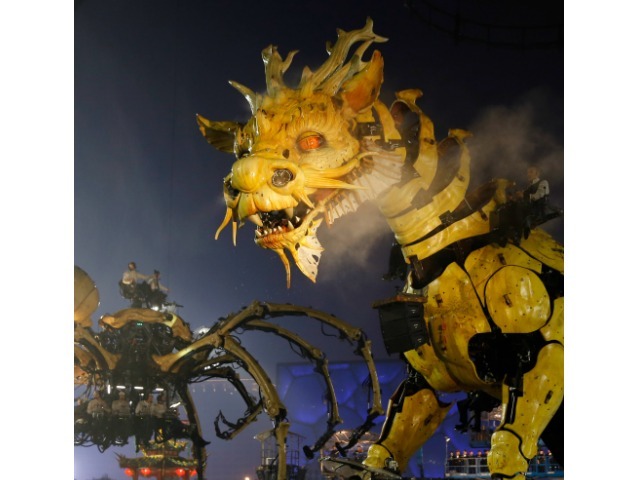 BEIJING, Oct. 20 (UPI) — A giant robot dragon battled a giant robot spider at Beijing’s Olympic Park to commemorate 50 years of diplomatic ties between China and France. French performance art company La Machine created and operated the robots for a series of shows during the weekend that reenacted a Chinese folktale to mark the 50th anniversary of China and France having diplomatic relations. The 40-foot-tall dragon, dubbed Long Ma, is a character from Chinese mythology with the body of a horse and the head of a dragon. The 50-foot-long spider, La Princesse, was created by the group in 2008 and has since been touring the world. The project won the approval of Chinese President Xi Jinping during a visit to France in March. The show was designed to combine Chinese culture with French art, the creators said. Sunday’s final performance was attended by Chinese Foreign Minister Wang Yi and French Foreign Minister Laurent Fabius.